Awesome Pasta Salad – Penne Pasta, with cucumbers, tomatoes, green & red peppers, green onions, olives, celery, peas, mozzarella cheese, in a creamy Parmesan cheese, dressing with basil and oregano. Cavatelli with Sun-dried Tomatoes – Cavatelli pasta mixed with imported sun-dried tomatoes, red and green bell peppers, black and green olives, tossed with balsamic vinegar and olive oil blend. Italian Herb Pasta Salad – Rotini pasta with broccoli florets, black olives, and red peppers, with Italian herb seasoned dressing. 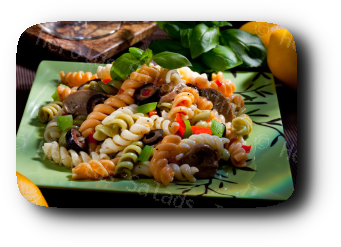 Lemon Spring Rotini – Tri-color rotini splashed with sweet lemon marinade, red and green peppers, sliced mushroom and onions.